Francis Sampson grows on two adjacent pieces of land right at the tip of Cornwall near Lands End. One of the areas is very exposed, open to the regular south-westerly winds but significantly, virtually frost free. 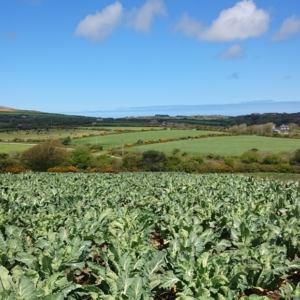 The value of such mild coastal strips is most apparent in winter when production of cauliflowers, spring greens, savoys and purple sprouting broccoli is difficult elsewhere. We would much rather sell Cornish produce than the often cheaper but energy-hungry Spanish version.